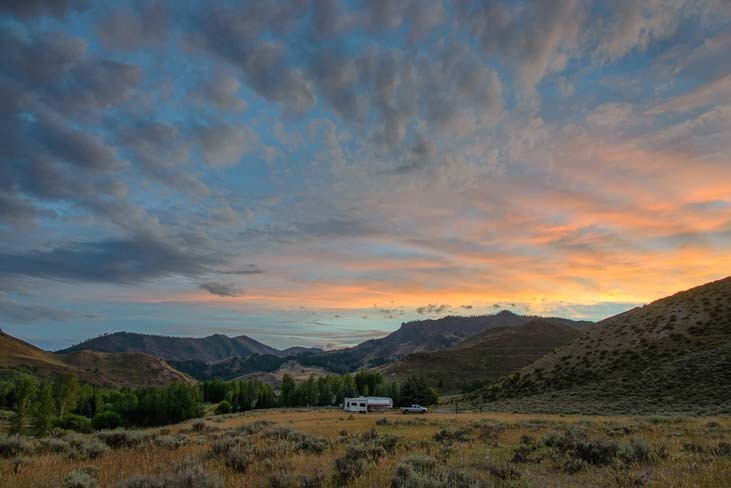 August, 2014 – We had been enjoying a wonderful stay in Sun Valley, Idaho, spreading out in some great camping spots and taking in lots of free summertime outdoor events. The wildfires that had nipped at our heels in Sedona, Arizona, and in Bend and eastern Oregon, were by now long forgotten, and after a few days of summer showers and thunderstorms, the air around us was crisp and clear. We wanted to do a “signature hike” in the area when the sun finally resumed its rightful place in the sky, and a ranger suggested the hike to Baker Lake. 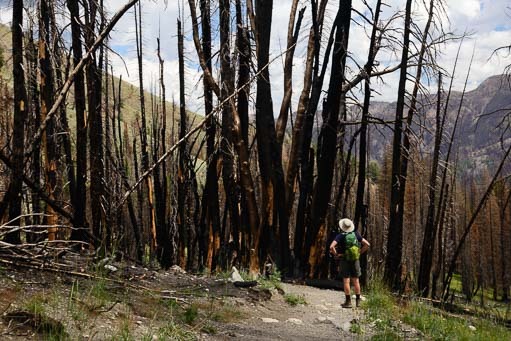 This had been the most popular hike in the area until it was devastated by the Beaver Creek wildfire of 2013. Now it was a hike through a burnt forest. Well, we’d seen enough fires in action this year, why not see what a national forest looked like once the embers cooled a year later? 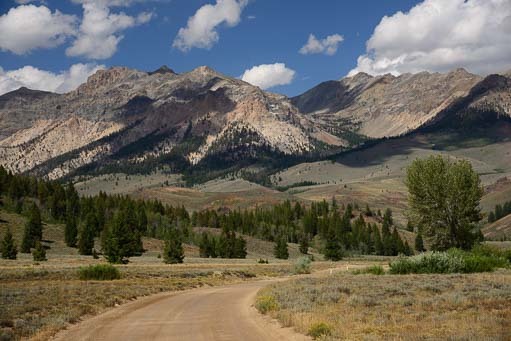 Beautiful mountains in the Sawtooth National Recreation Area. However, as we slowed down and took in the strange landscape around us, we soon found there was an eerie beauty to it all. A mysterious aura enveloped us. The Beaver Creek Fire had been the result of two separate fires that had joined forces. By the grace of God, the ranger told us, the winds had turned at the very last minute, before the flames raced down a canyon into town, sparing Ketchum from a true bath of fire. As we hiked, we saw large shards of blackened bark had fallen off the trunks of the trees, leaving intriguing lace-like patterns on the red-brown wood. 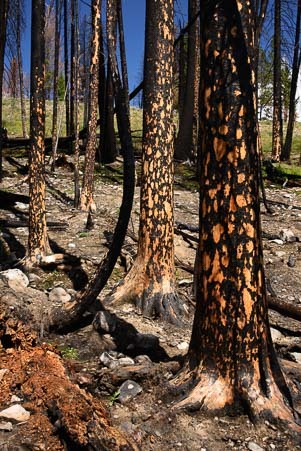 Scorched logs lay scattered across the ground, each filled with the funny checkerboard patterns that develop as wood burns. 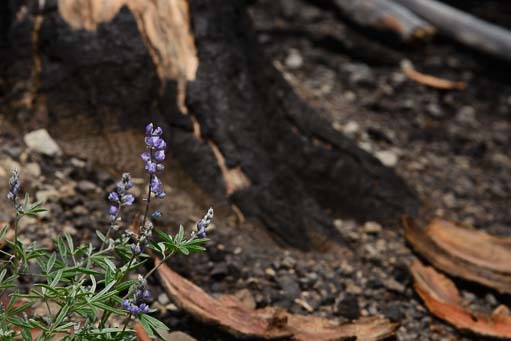 Scattered here and there between the singed roots and ravaged remains, little purple lupine flowers poked their heads through the cinders and basked in the sunshine. A thicket of tiny purple flowers filled the spaces between a stand of black stick-like trunks, and a few yellow flowers smiled up at us from their hiding places amid the wreckage. Fire in the sky at sunset — flames of the gods! 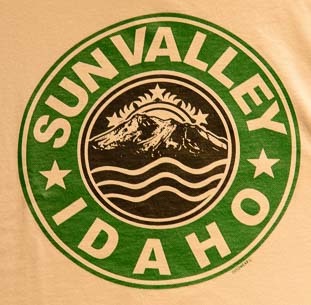 We had been in Sun Valley for nearly a month, and we were ready to move on. 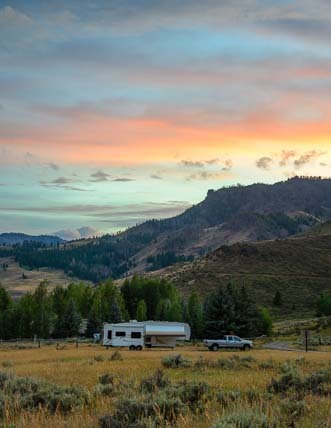 We packed up and made our way east from Ketchum, Idaho, through Craters of the Moon National Monument. This monument is a vast sea of lava flows that is the result of a series of violent volcanic eruptions between Idaho and Wyoming. Driving alongside this moonscape for many miles, there was nothing but black lava rock as far as we could see into the distance. Ironically, here we were facing another cataclysm, one much bigger than a forest fire and dating from a much more distant time thousands of years ago. 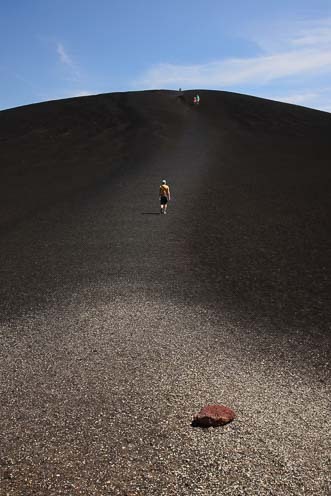 Most of the hiking trails wound through crooked trees and craggy lava rock, but the best one climbed straight up along the lava cinders to the top of a cinder pile. The more we explored the park, the more we felt its air of haunting melancholy. Placards along the trails told how, decades ago, in a misguided attempt to beautify the park, the National Park Service had poisoned all the trees that were afflicted with an ugly parasitic vine. 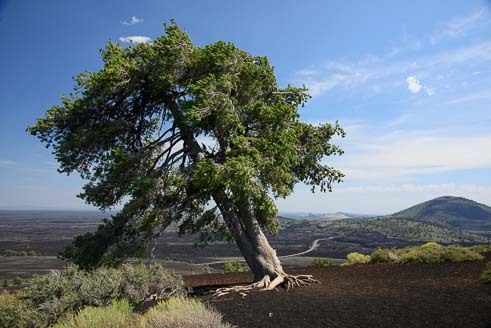 Only after all the parasitic vines had been successfully exterminated did the Park Service discover the delicate symbiosis between the vines and the now dead trees, one that is critical to the survival of the remaining trees. We left the park pondering the immense forces of nature and the wisdom of tampering with their balance. Can human knowledge control nature without disastrous consequences, or mastermind its energies without paying a price? An old volcano decorated with cell phone and radio towers slipped quietly past the car window. The hillside in Arco is covered with enormous white numbers. Arco holds a unique distinction. We arrived in the town of Arco, Idaho, and were immediately struck by the strange numbers that covered the hillside on the edge of town. What the heck was that all about? Were there mines up there? Looking a little closer, we soon realized these numbers were years — 2000, 89, 95 — and, asking around, we found out there’s been a long-standing tradition for the high school seniors to sneak up on the mountain and paint their school year on the rock. That’s no small feat, as the numbers appeared to be 30′ or so tall! Unfortunately, the Bureau of Land Management put an end to this practice about a decade ago. The EBR-1 control room is right out of Star Trek. We also learned that Craters of the Moon and the other vast barren landscapes in this region of the country are remote enough to have become the site of lots of weapons testing and nuclear power development over the years. 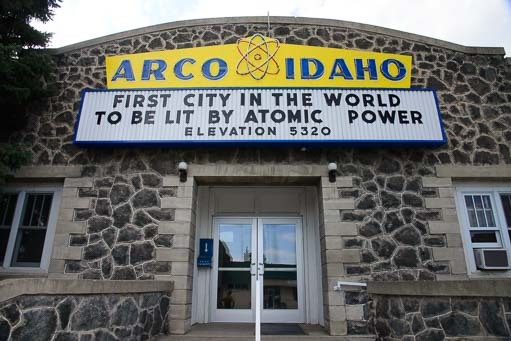 The little town of Arco stands out in history as the first city in the world to be lit by atomic power, and the nuclear power plant responsible, named EBR-1, is just down the road. 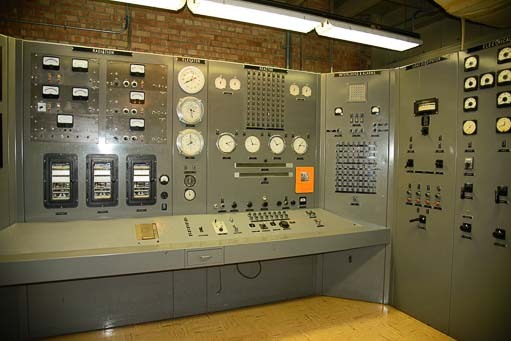 We took a tour, marveling at the 1950’s switches and dials in the control room. They seemed to come right out of Star Trek! A fast moving storm swirls above our buggy. Leaving Arco and EBR-1 behind, we traveled on to the shores of beautiful Palisades Reservoir. 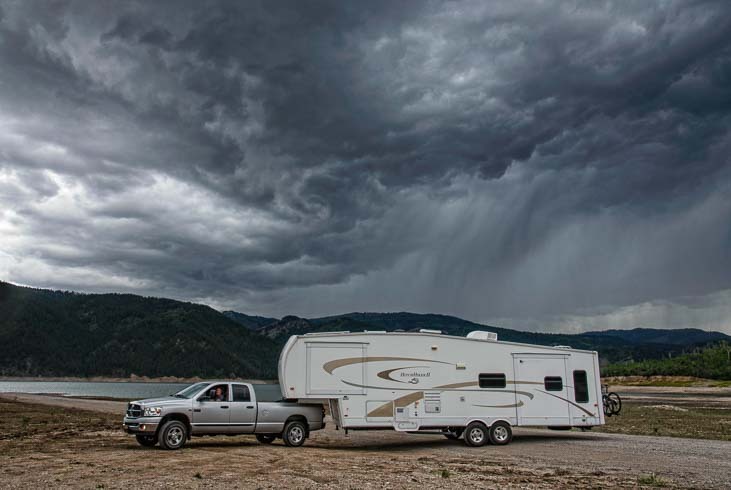 Just as we pulled the rig around to set up, nature unleashed her fury with a cataclysmic thunder and lightning storm. I was so taken by the sky, as I “helped” Mark get the rig parked, that I began snapping photos of it with the buggy in the foreground. It poured pitchforks for four days! Mark, of course, was struggling to get the rig parked and set up before the deluge hit while I leaped around singing, “Wow, this is AMAZING, it’s so BEAUTIFUL!” as I took more photos. Just in the nick of time, I got the camera put away and we got our little home set up. 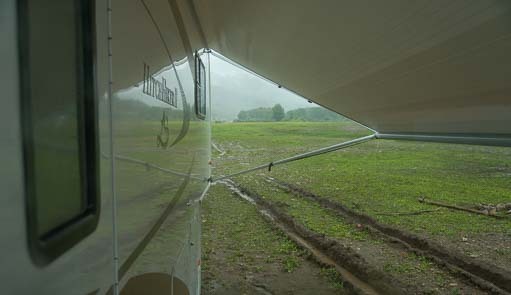 For the next four days we hunkered down as the rain fell in relentless torrents. Will we ever be able to leave? 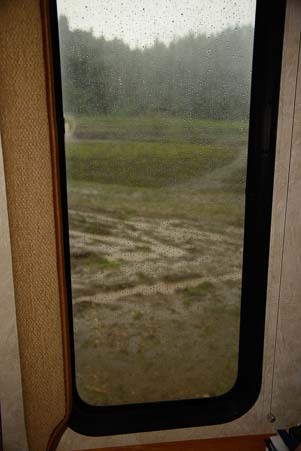 At one point, a knock on our door summoned us to the aid of four teenage boys whose muddy joyride in their Rubicon had left them stranded, hubcap deep, in lakeside muck. Luckily, the Mighty Dodge (with the help of Mark’s skillful driving and four eager boys pushing) was able to pull the Rubicon back to solid ground. At long last we awoke to a glorious sunrise, and the puddles around us soon began to dry. We looked around for Noah’s raven and dove to send out as scouts, but his little winged messengers were nowhere to be found. We had to don our boots and go outside for a look ourselves! After a day of drying out, we deemed it safe to hitch up and leave, and we slowly rolled on to Grand Teton National Park. 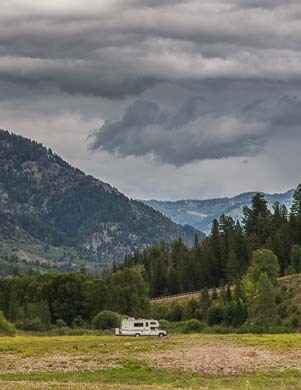 This entry was posted in Oregon and tagged Idaho, Idaho Southeast, National Parks US, New, Sun Valley Area, Travel, USA, Wild Skies, WP Travel by Roads Less Traveled. Bookmark the permalink. Our converter (left) in our trailer and our inverter/charger (right) on our boat provide supplemental battery charging as backup to solar power. Learn more here: Converters, Inverter/Chargers & Alternators. The Miracle Doormat (left) and Portable Solar Kit (right) were two things that caught our eye at the Quartzsite RV Show. We bought the doormat (love it!) and recommend the solar kit to folks looking for a simple weekend/vacation RV solar power solution. 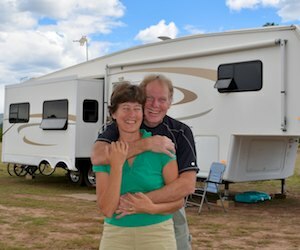 More info at this link: Quartzsite RV Show!